I went through the Starbucks drive through the other day with Zoe in my lap. 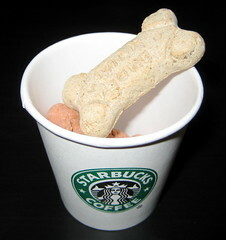 The Starbucks dude handed me my receipt then this little cup with milk bones in it for Zoe! How sweet! Zoe shared with her sisters of course.